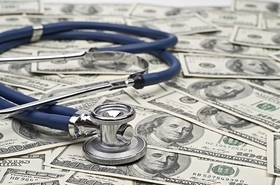 The provider sector once again beat out its healthcare rivals when it came to global private equity buyouts last year, accounting for 45% of total deals or nearly $19 billion, according to a new report from Bain & Co. Overall, Bain's report calls 2017 a "banner year" for healthcare private equity dealmaking, despite the political and economic uncertainty around the globe. The disclosed value of private equity deals in healthcare across the world reached $42.6 billion last year, the highest level since 2007 and up 17% from $36.4 billion in 2016. During the same time, the number of deals increased nearly 29% from 206 in 2016 to 265 last year. "Healthcare in general and providers within healthcare continue to be an area that's attracted a lot of private equity interest," said Jason Slocum, a co-author on the report and partner in Bain's Boston office. "There is a lot of capital chasing the deals that come up." This is the third year in a row providers have taken the top spot, drawing capital not only from U.S.-based private equity firms but from a range of international investors, Slocum said. In 2017, the top 10 largest healthcare buyouts ranged in value from $1.3 billion to $5 billion and accounted for nearly 60% of the year's total healthcare deal value, according to Bain's report. The provider sector saw 139 of the 265 healthcare private equity buyout deals that took place worldwide in 2017. The $18.9 billion in healthcare provider deals was up 27% from $14.9 billion in 2016. Meanwhile, biopharma buyouts, while only making up 62 of the 265 deals, or 23%, were worth $17 billion collectively, or 40% of the total disclosed deal value. That's up from 22% in 2016, according to Bain. As was the case in previous years, Bain found most provider sector targets were located in North America, the biggest being the $4.1 billion acquisition of Kindred Healthcare by Humana and two private equity firms. Another big one was American Securities' acquisition of Air Methods for $2.5 billion. Retail health continues to see intense activity within the provider sector. Many of its subsegments, such as vision, dental and veterinary care, remain fragmented, according to the report. That allows private equity funds to unlock substantial value through consolidation, which creates top-line scale through improved volume and pricing and bottom-line scale through local and corporate efficiencies. Slocum said his firm is starting to see a "next wave of retail health investing" he thinks will continue in the coming years that's aimed at operational improvement and driving same-store sales growth. He also predicts a growth in behavioral health investment following expansion of mental health benefits under the Affordable Care Act. "We're in the early innings of consolidation in the behavioral health market," he said. While physician practice management deals dipped last year, activity heated up in emerging segments like dermatology, women's health and gastroenterology, Bain wrote. Doctors are still eager to focus on clinical care instead of administrative duties and reap cost savings from being part of larger organizations, the report said. Joshua Kaye, a managing partner in DLA Piper's Miami office and chair of the firm's healthcare sector, said the provider sector is attractive to private equity investors because it's one of the most fragmented markets within healthcare. "When private equity is looking to deploy capital, they're looking for opportunities not just based on value, but what are drivers of value?" he said. "How can they bring their sophistication into solving a problem?" Kaye added urology and vision to the list of specialties he's seeing considerable interest in. Bain's report warns of five major disruptors threatening the healthcare sector: the Amazon effect, the digital revolution, regulatory changes, consumerism and personalized medicine. Kaye said he doesn't foresee Amazon presenting a meaningful threat in the short term, but he's monitoring the digital revolution closely, especially the value people with technology expertise bring into the healthcare setting. "I think we're just at the very beginning in how technology is going to disrupt the healthcare services industry," he said. Despite last year's flurry of deals, healthcare exits fell 7.9% to 116 in 2017 from 126 in 2016, while total value fell 31% to $44.4 billion from $64 billion, according to Bain. Ultimately, Bain wrote that investors in the future will continue to view healthcare as counter-cyclical and recession-resistant, and the firm predicts that valuations will remain high even in the face of stock market fluctuation and rising interest rates. Want to continue the conversation about venture capital in healthcare? Join Modern Healthcare on June 7-8 at its Transformation Summit. To learn more and register, visit ModernHealthcare.com/TransformationSummit.